You are about to take your first step of the adventure of a lifetime. To apply to join the US Contingent to the 24th World Scout Jamboree, read the instructions immediately below and click the blue and white “Apply Now!” button. To edit an existing application, submit a payment, or apply for a scholarship, see the yellow buttons further down. For more information about applying to join the Contingent, the Contingent Cost, and the Contingent Scholarship program, see the red buttons and the information down the rest of the page. General information about the Jamboree can be found on the FAQ and Blog as well as our social media pages. If you have any problems or questions, please email uscontingent2019@scouting.org. 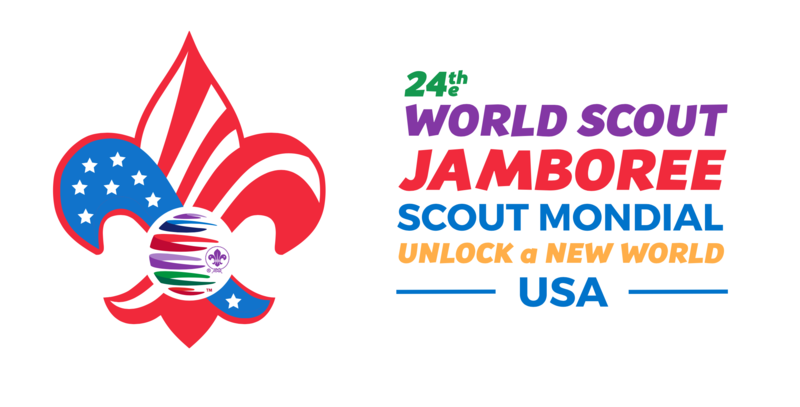 Clicking the link below will allow you to register to be a part of the US Contingent to the 24th World Scout Jamboree. This process may take some time, expect to take 30-40 minutes completing the following form. Before starting, be ready to provide your BSA ID number and a $250 deposit. Having trouble with registration? Email uscontingent2019@scouting.org for help. Click “Apply Now” to start a NEW APPLICATION. If you need to finish and/or edit an application that you have already opened, click “Edit Application” below. By applying to attend the 24th World Scout Jamboree as a member of the Boy Scouts of America Contingent, you take your first step towards experiencing a larger scouting world. Whether you are a participant, an adult leader, or a member of the International Service Team, you will be camping side by side with your brother and sister scouts from 169 countries. You won’t want to miss out on this unique experience. Follow the Contingent Facebook, Twitter, and Instagram to stay in the loop with everything you need to know about the Jamboree. If you need assistance with your application, contact member care at 1-972-580-2489, option “1” between the hours of 7:00am-7:00 pm Central time, or you may send an email to uscontingent2019@scouting.org. Member care will have someone contact you with assistance as soon as possible. Birthday before July 22, 2001 (age 18 and older) – Adult unit leaders (age 18 and older) and International Service Team (IST) age 18 and older. Applying does not guarantee a spot with the US Contingent. Once you finish your application, it will be sent for further approval and review by your Council and the National Office. For more information about participation, read the invitation letter here. For tips on the application process for Participants, download this guide. For tips on the application process for Adults, download this guide. For a list of adult leader qualifications and selection criteria, see our resources page. For a list of IST (Staff) Positions, see our resources page. The Contingent Payment system is now online. See the button below to make your payments. International Service Team (IST) – IST will receive four-person wall tents and cots. Staff will eat in the staff dining hall and have lunches that are portable and do not require cooking. The IST fee does not include transportation and travel related expenses. Transportation to and from the Jamboree will be the responsibility of the IST member based on when they need to report or depart from their staff assignment. The World Jamboree Organizers (Host) will provide transportation to and from a limited number of Gateways to the jamboree site. Those Gateway locations are identified as Yeager Airport in Charleston, WV, Charlotte/Douglas International Airport in Charlotte, NC, the AMTRAK station in Prince, WV, and the Ruby Welcome Center in Mt. Hope, WV. *Early Bird Discount – applicants who submitted a $250 deposit between November 1, 2017 and January 31, 2018 and make all additional payments on time will have a $100 discount applied to their last payment. See here for the Contingent Refund Policy. Click the button below to login and make your next payment. If you are not chosen to be part of the 2019 World Jamboree Contingent or IST, you will receive a FULL refund. All requests for refunds due to personal cancellations are to be submitted in writing to uscontingent2019@scouting.org. All refund requests received before March 31, 2019, will be processed within six to eight weeks upon receiving the request. All refund requests received on or after April 1, 2019, will be processed six to eight weeks AFTER the close of the Jamboree. If you are not chosen to be part of the 2019 World Jamboree Contingent or IST, you will receive a FULL refund. Requests for refunds resulting from a change in the overall staffing needs of World Jamboree will be evaluated by U.S. Jamboree Administration on a case by case basis through April 30, 2019. If you are not chosen to be part of the 2019 World Jamboree International Service Team you will receive a FULL refund. All requests for refunds due to personal cancellations are to be submitted in writing to uscontingent2019@scouting.org. All refund requests received before March 31, 2019, will be processed within six to eight weeks upon receiving the request. All refund requests received on or after April 1, 2019, will be processed six to eight weeks AFTER the close of the Jamboree. If you are selected you will not be eligible for a full refund. In cases where the request involves shifting from Jamboree staff to contingent leadership (e.g., a registered IST member who is needed as a Jamboree contingent leadership member), a full refund will be made regardless of the date of the request. Medical emergencies, natural disasters, and activation of military orders may entitle you to a refund. This will be decided on a case by case basis. Please submit your request in writing, along with supporting documentation to: uscontingent2019@scouting.org. If a position has not yet been offered, all submitted fees are refundable.